1.3. Four slide directions. 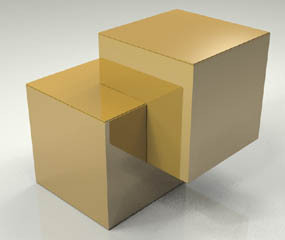 In Figure 4 we see an assembly of four rectangular shapes with two halfway cuts each. 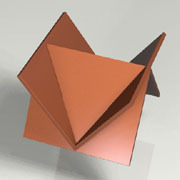 The enclosed shape is a tetrahedron. The only way to put the pieces together is sliding them together all at the same time. The discovery of this structure was the start for my research. Many questions arose. For instance: are there more, similar, structures like this one? How can we make infinite slide-together structures? Is it possible to use even more slide directions? 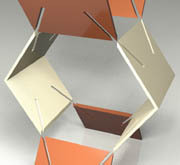 And which systems can be assembled only by sliding together all the pieces at the same time? Besides the extension of the basic tetrahedral slide construction (Figure 5) I also found another way to build an 'infinite' tetrahedral structure as can be seen in Figure 6. 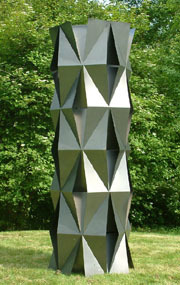 This sculpture consists out of 104 flat triangles, slid together all at the same time. Figure 4,5,6: Tetrahedral structures (Fig. 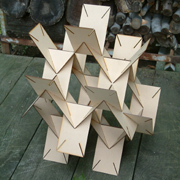 5: wood - lasercut : Fig. 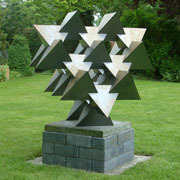 6: steel - lasercut). 2.1. Double pieces. The two infinite structures in Figure 3 and Figure 5 are both generated by doubling the basic pieces. 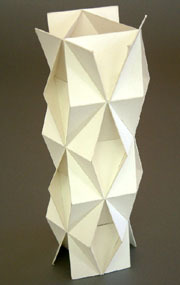 A first idea in trying to find new shapes and structures was by introducing a 'folding' line into the pieces. Not as a hinge between the two 'half' pieces but as a rigid connection between the parts. 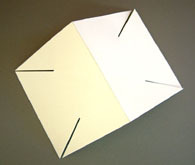 In the first example with the basic structure of the ring of Figure 2 (three slide directions) the use of the 'folded' pieces leads to an object that looks like 2 connected cubes. And also this object can only be taken apart in two groups of three pieces before you can separate all the pieces from each other. 2.2. Slide together cylinders. When we double the pieces of the tetrahedral structure, we can create a variety of different cylinders by changing the angle between the 'halves'. All these cylinders can only be taken apart by sliding away all the pieces at the same time. 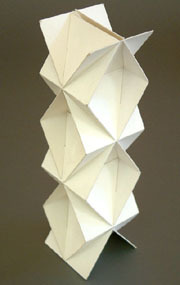 The cylinders can be seen as a stack of antiprisms. 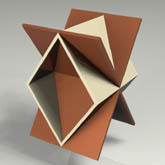 The first cylinder in the set is a stack of tetrahedra, which also can be seen as the first member of antiprisms. 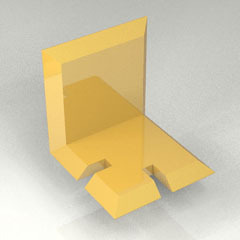 The next member, based on the three-sided antiprism, has the same structure as the ring of Figure 2, and therefore you might expect that it can be split into two parts by sliding along one of the sliding lines, but because of the doubling of the pieces the number of sliding lines has also been doubled, which changes the sliding system.